Every summer, we visit my parents so we can glory in East Coast summer weather, grandparental (and parental) affection, and the abundance of my father’s garden. Depending on when we arrive, we might be gorging on berries or potatoes, and this year my dad promised both, but he also offered kohlrabi, a crop he had tried for the first time. 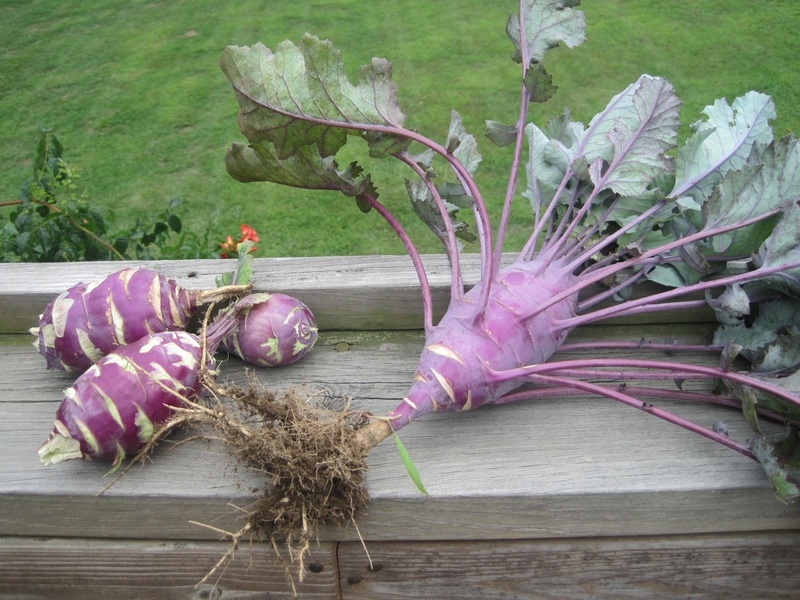 “I hope you will pack your favorite kohlrabi recipes,” he emailed me before we arrived. So, as it turns out, kohlrabi is something like a turnip and something like a radish: crunchy and refreshing, with a slightly sharp tang. 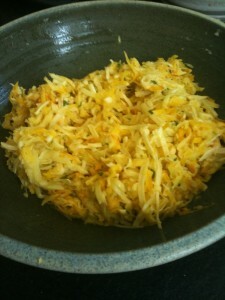 It’s delicious, and pretty versatile: you can eat it raw, grated into salad (recipe below), you can cook and eat the leaves (which we did, flavored with a little soy sauce and sesame oil), you can cut it into sticks and roast them (we did that, too) or make it into a gratin (which we might do when it’s cooler). 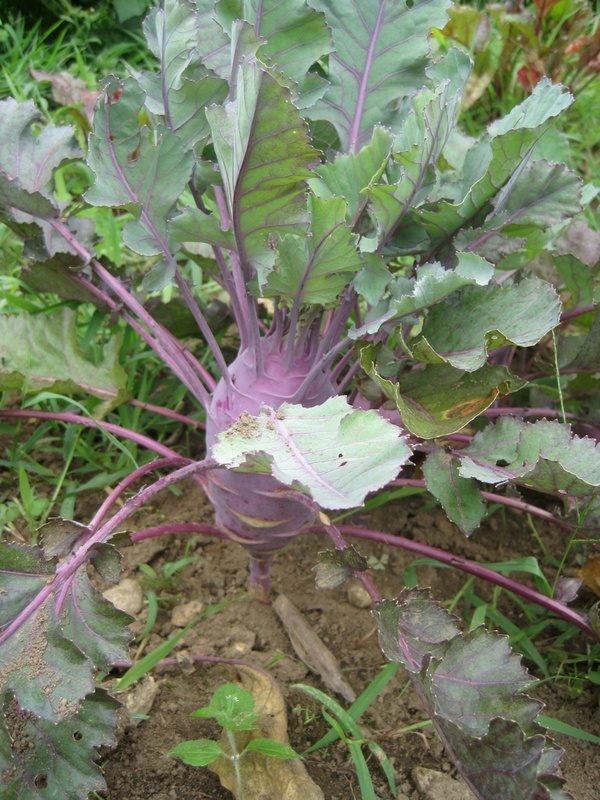 Because yes, our CSA is now bringing us kohlrabi every week, so it’s a good thing we’ve learned how to cook it, because now we’ve really learned to like it! Combine the vinegar, shallots, garlic and 1/4 t salt in a small bowl. Let stand for 15 minutes, then whisk in the mustard, sour cream or yogurt, and oil until thick and smooth. Grind in a little pepper, then stir in the herbs and capers. Taste and adjust the seasonings if needed. 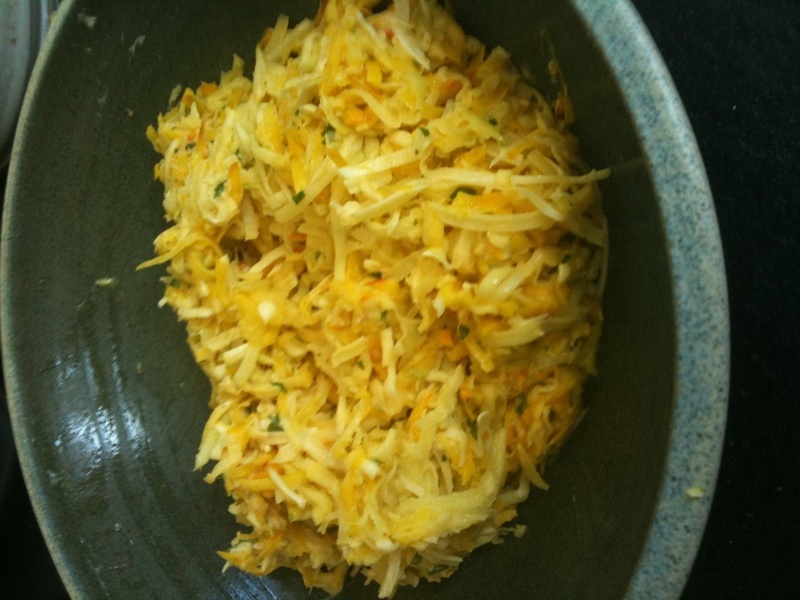 Then, peel and grate a pound or two of fresh raw kohlrabi, or use a mix of kohlrabi, parsley root, carrots, and beets — whatever vegetables you happen to have on hand. Dress with the vinaigrette and serve.